Roasting peanuts on the stove top is easy. Find here instructions for How to roast peanuts on the stove top. Roasting peanuts on the stove top is very easy and takes only a short time. Roasted peanuts have a long shelf life so it is worth doing it at home. Roasted peanuts are available in the market but roasting them at home is very easy. Once you know how to roast peanuts at home, you are likely to do it yourself. Roasted peanuts are used in many ways such as, for adding into many dishes such as salads. Roasted peanuts also make a good healthy snack. Roasted and salted peanuts taste great as a snack. 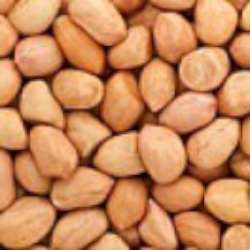 You may use unshelled or shelled peanuts for roasting. Unshelled peanuts take a bit longer time than shelled peanuts. Below you will find instructions to roast shelled peanuts. You may use a frying pan or a karhai , kadhai (wok) for roasting peanuts. Using a wooden spatula makes it easier or you may also use a metal spatula or a large spoon. 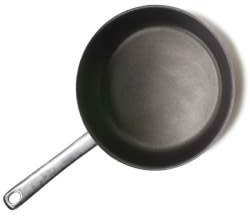 Heat your pan or wok (karhai). Add peanuts and reduce flame to low. Keep stirring continuously so as to roast the peanuts evenly all over. If you do not keep stirring the peanuts may cook more on one side or even get burnt marks. Remember to stir on low flame for about 7-8 minutes. The actual time needed will depend on the size of the peanuts. The peanuts will also make a crackling sound when they are roasted. You will start getting the roasted smell after about 4-5 minutes. When you get that wonderful smell of roasting peanuts, take out one or two peanuts from the pan with your spoon or spatula and put them on the kitchen counter to cool a little. Rub the peanut between your thumb and forefinger. If the peanut skin comes off easily, the peanut is done. You may also test and taste the doneness of the peanut by putting it into your mouth after cooling it a little. 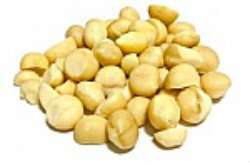 If peanuts / groundnuts are not yet roasted according to your liking, continue stirring and roasting. Check again after a minute.Once done, remove from the flame. The ground nuts continue cooking while they are cooling. So take care not to overcook them while on the stove. After the peanuts / ground nuts are cooled completely, you may store them as they are or remove their skin. Most of the time I prefer to leave the peanut skin on. You may also powder the roasted peanuts if you want. You may use the roasted peanuts for making dry shenga chutney or for making peanut chutney paste. Peanut chutney - shengdana - groundnut chutney to serve with Idli, dosa etc.